This season, I've been a tad bit obsessed with apples. (and pears.) Trust me: I've been resisting the strong urge to have every post on this blog be about apples. I don't know--does anyone else go through phases like this with fruit and ingredient obsessions? Or am I just particularly weird? These macarons are my love affair with apples encapsulated in a tiny two-bite form. It's as if you take everything amazing about an apple and squeeze and compress it--with great, magical pressure--into a single macaron. 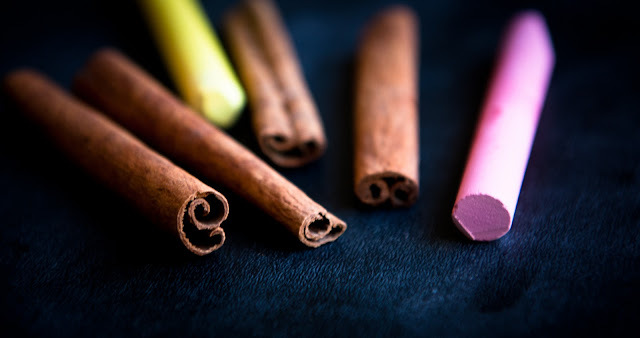 The shells are cinnamon-spiced and sweet, brittle on the outside with just enough chewy bite on the inside. The buttercream is packed with the essence of apple flavor from the intense homemade apple butter mixed in--an apple butter that sat stewing and bubbling on the stove over low heat for two hours, caramelizing with the brown sugar and soaking up clove and cinnamon fragrances. And, at the heart of the macaron: an extra, extra tart crunch from chunks of crisp, fresh green apples lightly tossed in sour lemon juice and woodsy ground cinnamon. I barely shared any of these with anyone else, being so busy gobbling them up myself. Have you entered the Breast Cancer Awareness giveaway yet? You have until this Sunday! makes ~20 oz. apple butter, far more than you'll need for apple butter buttercream, but delicious to have around for other uses! 1. In a large pot over medium high heat, combine the apples and apple juice and cook until the apples are completely tender, about 15-25 minutes, depending on the size you chop the apples. If a foam forms, you may skim it off if desired. 2. Remove the pot from the stove and let cool briefly. Puree the apples and apple juice in a food processor or blender until completely smooth. 3. Return the puree to the pot and add the brown sugar, cloves, cinnamon, and lemon juice. 4. Return the pot to heat and simmer on medium/medium-low heat, trying to maintain 220 degrees F. Cook for 1-2 hours, stirring regularly, until mixture really thickens and darkens and bubbles/splatters. Remove from heat when desired consistency is reached. *Add only 1/2 cup sugar for a less-sweet apple butter. I used 2/3 cups sugar and while still really good, it was a little on the sweet side for me. 2. Combine the powdered sugar, almonds, dried apple, cinnamon, and green food coloring, if using, in a food processor and grind until a fine powder. Sift thoroughly through a fine mesh strainer and set aside. 3. In a small bowl, have ready the granulated vanilla sugar. 4. In a separate mixing bowl, combine the egg whites and the cream of tartar. Using a balloon whisk, quickly stir the mixture until the entire surface is covered with foam. Then, start whisking the egg whites, gradually adding in the granulated vanilla sugar. Whisk until you reach glossy, almost-stiff peaks. 1. Whip the egg yolks until light and shows definitive streaks when you move your whisk through them. 2. In a small saucepan, combine the sugar and water and stir until the sugar is completely wet. Cook over medium high heat, without stirring, until the sugar reaches 238 degrees F. Immediately remove from heat and (carefully!) gradually pour into the egg yolks while whisking, being careful not to hit the whisk wires. 3. Continue whipping the egg yolks on medium high until the the outside of the bowl is no longer hot or warm to the touch. 4. Add the butter in while beating, one tablespoon at a time. 5. Once the butter is incorporated, beat in the apple butter. Use immediately to fill the macarons (or, if you refrigerate the buttercream, bring to room temperature and beat to restore texture before using). 1. Toss the apple chunks with a light coating of lemon juice. Then, sprinkle with cinnamon. 2. 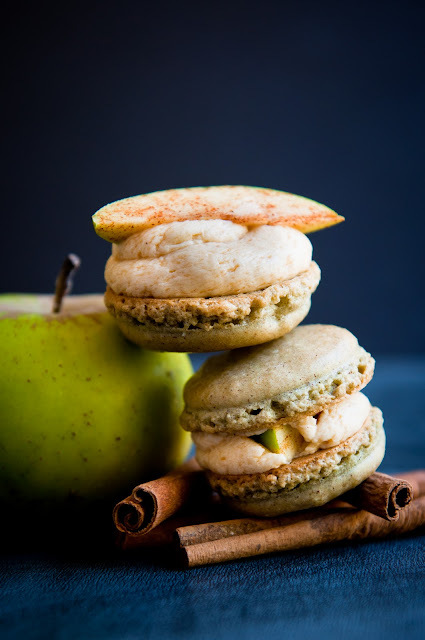 Fill the macarons with the apple butter buttercream and apple chunks. Let the macarons "cure" in an airtight container in the refrigerator overnight before serving. These look truly amazing! I love the display with the tree! Too cool. The debut! I absolutely love that you strayed from tradition macaron etiquette with that thin layer of filling, and instead opted to beef it up with apple cinnamon chunks. I think I'd prefer you macarons anyday. And nothing is wrong with a healthy obsession now and then! The chalk background is absolutely stunning, too. I'm hoping to start using pumpkin soon, but I'm having a difficult time sourcing both the squashes themselves and the cans of the processed stuff. Boo. Love! if I were to make macarons it'd be either penaut butter and chocolate or these ones! Apple is my favorite food! they look amazingly delicious! I'm new here by the way. hi :) Love yout blog! You are brilliant. That's all. Love these!! So creative and fun! Also, I adore the chalkboard tree. These look so delicious and I LOVE your apple tree:) So clever! @squirrelbread: Oops! I didn't even know macarons are traditionally stuffed with just a thin layer of filling. ;-P I've always been a double-stuffed oreo kind of girl. @whisk-kid: hm... I'd heard tremors about a pumpkin/squash shortage. :-( Hope you can find some soon--can't wait to see what you do with it! 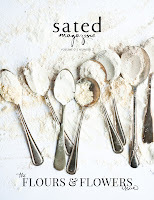 @buttersweetmelody: Welcome to the blog! I just died looking at your macarons. LOVE! And your chalk drawings are so cute! Fave is the "nom" reference to your eaten macaron. XOXO! This looks so good and fun. I admit I have ingredient OCD as well ;). Well I don't know if it's a rule; that's just how I've seen them. In photos, mind you. Never actually eaten one... and I'm sure I have no idea what I'm talking about. Double stuffed is always better in my book! @Tunde: glad I'm not the only one! Hi there! You've inspired me to make macarons for my 24th birthday next month! Because there's nothing like a kitchen challenge to distract one from the onslaught of the mid-20's. Thanks! @Zita: you are so funny! :-D Happy Birthday! @Anita: oh, mid-20s. I. feel. your. pain. Best to drown it in some booze + macarons. Wait, even better: boozy macarons. Gosh not happy. Just wrote my rant and internet explorer chucked a sad on me. Apple macarons! Well, I haven't ever tasted an apple flavoured macaron (sadly it doesn't seem a popular flavour but somehow pistacio is) which makes it even more novel. But on the other hand I'm actually here to unashamedly gloat. Sometime long, long ago (April this year actually), you had a post whereby you had put up the recipe to an insane looking black forest cake and your "in Una Selva Luminosa" collection which I excitedly showed my boyfriend and he agreed that the pictures were pretty great. Now apparently I also unthinkingly said something along the lines of "Ahhh~~ imagine if I could get big prints of them and put them in my apartment. Wouldn't that look fantastic?" Then yesterday, he pulls my birthday present that he's been hiding in his cupboard out for me, and turns out he bought 4 prints out of 8 in the collection from you and framed them here in Australia and now they're hanging on my apartment walls, one in the lounge and one in my bedroom. So, I don't really know what the point of this whole rant is, but I guess its just to say, your work is gorgeous and it looks even better on my walls! Iris! This is absolutely amazing--I'm so happy to have been a part of this, though to be perfectly honest, I had no idea what Mark was planning. So thrilled that to hear that you love the photos and that they are decorating your walls well. :-) Happy Birthday! I love your macaron tree. Beautiful and gorgeous recipe too. I love apples in an ordinary an-apple-a-day kind of way but your description of these macarons nearly had me drooling. And don't worry, I go through ingredient obsessions too :). 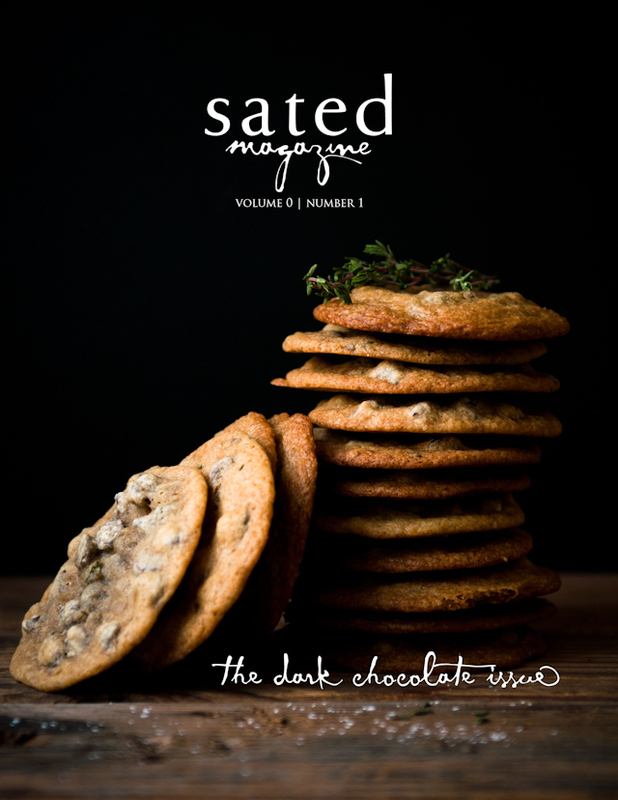 oh yumm.. i have been meaning to make macarons lately, this recipe looks amazing! 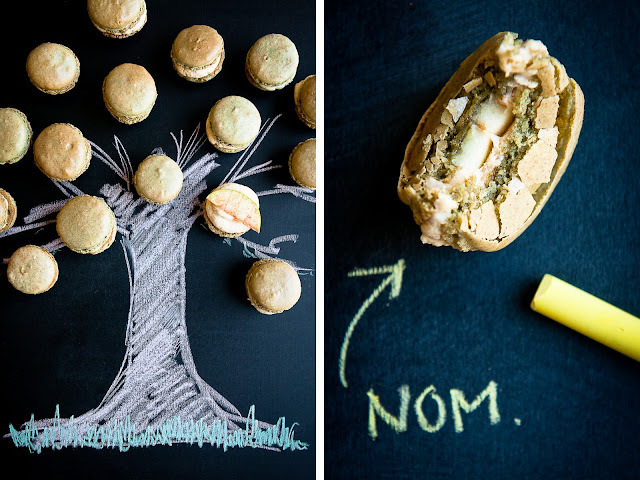 That chalkboard macaron tree is SO CUTE. Since I go through obsessions about everything, it should be no surprise that I have ingredient... fetishes. Right now it's dill. These are phenomenol!!! Perhaps a new fav macaron for me!! Lovely photos! What a delicious looking apple treat. I have so many apples this Fall from my trees and can't figure out what to do with all of them. A girl can only eat so much applesauce LOL. Thanks for sharing this recipe. 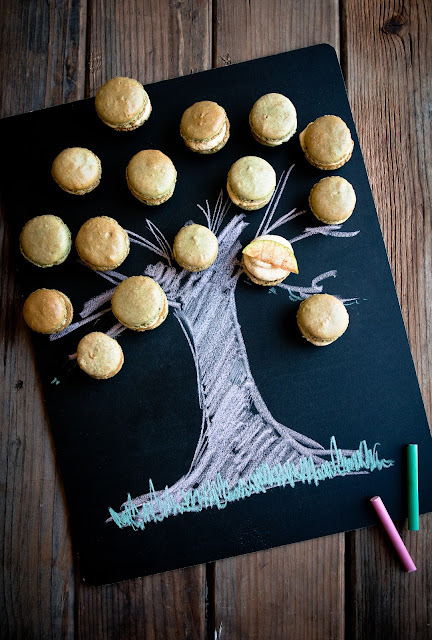 I love how you drew (or someone did) a picture of a tree and had the macarons as the "apples." very smart and cute.